Forest Woods is now almost sold out. Only a handful of 3 and 4 bedroom units left. If you are looking for more options, you might want to consider Park Colonial or Woodleigh Residences, both beside Woodleigh MRT station in Bidadari Estate. Forest Woods is a new condominium that occupies a very attractive location in Upper Serangoon Road. By one of the top developers, City Developments. Part of its attractiveness lies in the fact that it is barely 5 minutes walk from the Serangoon MRT interchange Station on the North East & Circle MRT Lines, and from Nex mega mall. 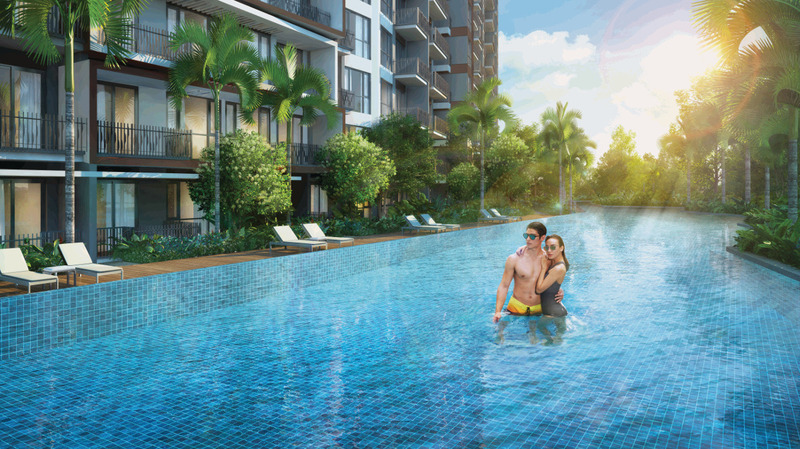 Forestwood Residences is looking to launch for sale in September / October 2016. 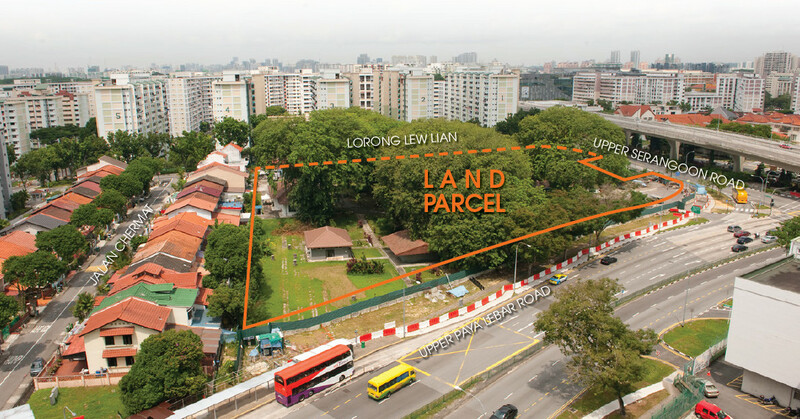 The Forest Woods condo site is sandwiched between Lorong Lew Lian & Paya Lebar Road, one of the most established residential estates in Singapore. In fact, to the north and south of the site, are mainly low rise landed houses. So there should be good wind flow, and a feeling of spaciousness for the site. The Forestwood Residences site is bordered on the north by a viaduct. But given CDL’s extensive experience in developing all sorts of sites, and strong reputation for good design, the site layout will mitigate that. Of course if you book your Forestwood Residences unit early, like at the VIP Preview, then you can probably get to pick a unit in a very nice part of the site. Do contact us to be kept posted on Forest Woods condo if you would like to invest, or live here. Located less than 5 minutes’ walk from Serangoon MRT interchange station, that connects the North-East line & the Circle Line. The Forest Woods site is barely 6 minutes walk to Nex megamall, the biggest shopping centre in the North-East region of Singapore. You can get groceries & food round the clock, from the 24 hour Cold Storage & NTUC Fairprice Xtra supermarkets there. As well as a wide array of shops and F&B outlets, plus a public library, and a cinema. The Paya Lebar area enjoys firm ongoing demand from homebuyers and investors. The most recent launches in Paya Lebar are pretty much sold out: Bartley Residences by Hong Leong (sister company to CDL) is 100% sold; Bartley Ridge also by Hong Leong is 99% sold; Botanique @ Bartley is over 95% sold. Forestwood Residences is already drawing keen interest, and is expected to be popular too. As for the Upper Serangoon area around Serangoon MRT station, there has not been a condo launch for many years, except for Jade Residences, a small project that is also sold out. So there is pent up demand here that augurs well for the Forest Woods condo launch. The closest new launch is Stars of Kovan, one train stop further from town, at Kovan MRT Station. However that is a mixed development with shops on the ground floor, which is not to everyone’s liking. 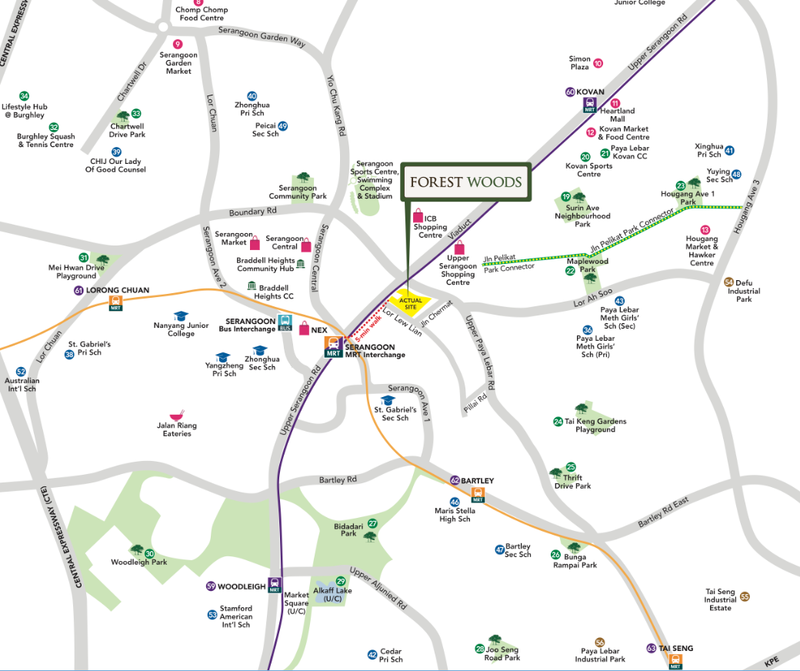 The Forest Woods condo site enjoys easy access to major expressways like the CTE & KPE. 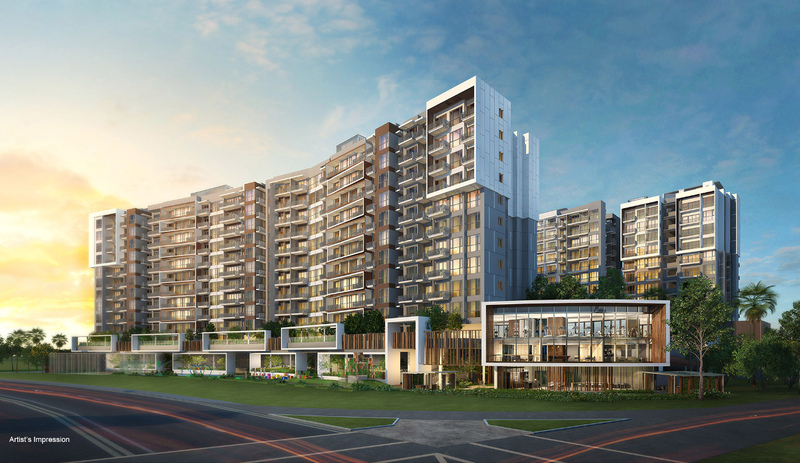 Forestwood Residences is a mid size project with just around 500 units. A very nice size – big enough to support all the necessary facilities without an onerously high monthly maintenance fee, yet not so big that the place becomes too crowded and busy. The kind of size that encourages neighbourliness and a cosy ambience, great for families. The Forest Woods condo is being developed by a leading developer, City Developments (CDL), with a solid and long track record of numerous quality homes. Those who have bought CDL property before, tend to look for CDL projects when buying again. Please email us for information or showflat viewing, and we will revert shortly. This entry was posted in Forestwood Residences and tagged forestwood cdl, forestwood condo on June 9, 2016 by Reviewer. Forest Woods, as its name implies, is a development that is inspired by greenery, trees, plants, flora & fauna. It is designed very much around the theme of living in harmony with nature, in an as eco-friendly a way as possible, like a sanctuary within lushly landscaped grounds. The initial inspiration for Forest Woods was seeded by its historical context. The name for this location, “Serangoon”, is thought to have been derived from the Ranggong bird, a species of stork that previously abounded in the swamps around Serangoon River (or the Rangoon River). 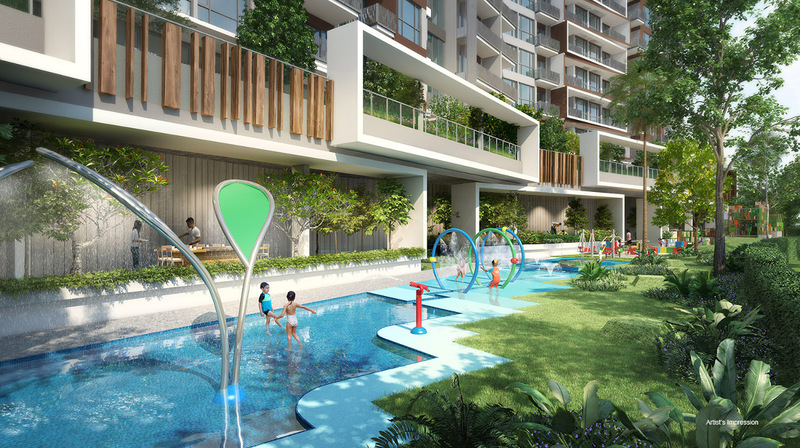 Forest Wood condo tries to capture the essence of that, the fleeting sense of nostalgia from former days, when Serangoon was covered by the lush green of tranquil forests, with shifting patterns of sunlight & shade dappling through the trees. The architecture of Forest Woods keeps to pure forms. It uses the understated approach of the box & frame design, with overhanging ledges, so that it complements the landscape like a living forest growing out of it. This development comprises 7 blocks of 12-storey residential apartments. The site layout has been consciously designed to maximise block-to-block spacing, to create a sense of space between them. These blocks are complemented by the vibrant greens & blues of the landscape, that flows from the “forest walk” theme stretching all the way down the eastern side of the site, to a more manicured & orderly western part. Forest Woods condominium aims to offer a lifestyle that engages residents, a place for their children to grow up more with nature, one they can truly feel is a home. Please register here to receive further updates on Forest Woods condominium. If you like this concept of lots and lots of greenery and landscaping, you should also consider Kent Ridge Hill Residences. Now that Forest Woods is almost completely sold out, leaving only a handful of 3 and 4 bedroom units, this next new project launching in October to November 2018 should help cater to those who missed out on the small units. And if there is one thing that Kent Ridge Hill Residences really stands out for, it is in the sheer amount of greenery that the residents will get to enjoy. There is firstly, the Kent Ridge Hill Park directly behind the site. It is on higher ground, and is part of the Southern Ridges Green belt, that stretches as far as to Telok Blangah and Mount Faber. Being on higher ground directly behind the Kent Ridge Hill Residences, means that this condominium is set against a lovely emerald-green living back drop. On top of that, the Kent Ridge Hill condo is zoned for a low-rise residential area, no more than 5 storeys high, in keeping with the character and profile of the landed houses around the neighbourhood. That is where it differs from Forest Woods, or for that matter, from Martin Modern and Park Place Residences, that are all high-rise developments. These are much denser developments, more in keeping with their more city-like environment. It is not that Kent Ridge Hill Residences is further out from the city centre than most of the others, like Park Place Residences. In fact, quite the reverse; it is actually nearer to town than Forest Woods. However its neighbourhood is zoned low rise, in keeping with the character of the landed housing estate in which it sits. The Kent Ridge Hill condo itself will provide 498 apartment units plus another 50 strata landed houses. This townhouses enjoy the full range of condominium facilities while maintaining the privacy and spaciousness of landed housing. There will be 2 types of these: a 4 bedroom type, and a 5 bedroom type. This entry was posted in Forestwood Residences on June 8, 2016 by Reviewer. The unit types and sizes have been released. See below. Also, a sneak peek of the design, as seen in the City Developments 1st Half 2016 Analyst Report. Forest Woods condo will be set out in 7 blocks of 12 storeys. 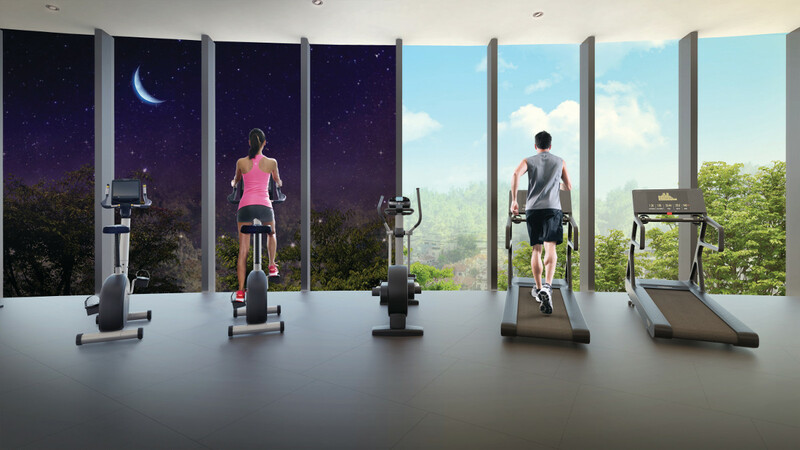 As seen from the artist’s impression, it displays the strengths of a typical Hong Leong / CDL design: towers separated from the roads by greenery, an eye-catching clubhouse and 24-hour gym, and lovely landscaping. The Woods Square condo unit mix bears further testimony to the wealth of experience that CDL / Hong Leong has in developing residential projects, and it’s ability to read the requirements of the local market very well. It is a good spread, not too over or under-supplied in any particular type. However, if the most recent launch, at Lake Grande, is any gauge of current buyer demand, then the 1 bedroom + study, and possibly the 2 bedroom units, could do well on the launch day itself. The Upper Serangoon / Paya Lebar area is also very much an owner occupied area, so the 3 and 4 bedroom units could garner good demand at the launch too. Please register here to receive further updates on Forest Woods condominium once available. Now that Forest Woods is on the point of selling out, and in fact has sold out all its smaller and mid-size units, it’s time to turn our attention to other new projects that are launching for sale soon. There are two – Florence Residences and Mayfair Gardens, both different types of condominium project from Forest Woods. For a start, they are in different locations. The Mayfair Gardens condo is located in a much more upscale neighbourhood, at Bukit Timah along Dunearn Road. This is an exclusively private residential estate without a single HDB flat in sight, as the land around here is just too costly. Bukit Timah is by-word for being one of the most high-end residential neighbourhoods, and especially for its brand name educational institutions. Whereas the Florence Residences condo is actually not too far away from Forest Woods. In fact they share the same MRT line, the North-East Line, a mere couple of stations apart, and both are in District 19. Around the Mayfair Gardens condo location, are also a number of international schools, such as the Singapore Korean International School, the Swiss School in Singapore, the Hollandse School, and the German European School. It is also within walking distance of Methodist Girls’ School across the road at Blackmore Drive, the Pei Hwa Presbyterian Primary School, and Ngee Ann Polytechnic. Whereas around Florence Residences, within walking distance actually, is Holy Innocents Primary School. This is a SAP school, and probably among the most sought after in the North East of Singapore, apart from Nan Chiau Primary. Apart from that, Mayfair Gardens is a charming low-rise development, 5 storeys high. It numbers just 215 units ranging from one bedders, to 4 bedroom apartments, and 6 penthouses. The design is inspired by Mayfair Gardens in London, but is a modern take on the style, with a very attractive looking end result. Mayfair Gardens is just one half of the Mayfair Collection. Next door to it is its sister project, to be called the Mayfair Modern condo, that will only be launching later. If you are interested to view the showflat just behind the King Albert Park MRT station, just drop us a line and we will be glad to send you the floor plans. A consortium of Verwood Holdings, Intrepid Investments & TID Residential won the URA (Urban Redevelopment Authority) land sale for the Forestwood launch site with a bid price of $321 million. This works out to $7,641.95 per sq m, or $710 per sq ft (psf) of gross floor area for the land itself. Another JV, of Singland Homes & UOL Venture Investments, came in 2nd with a $312,880,000 bid, just 2.6% lower. In 3rd place was a Frasers Centrepoint venture, FCL Topaz & Sekisui House, at $311,109,800, barely 0.5% below the 2nd placer. The closeness of the top 3 bids seems to indicate a consensus as to the value of this site. It is a good sign, as buyers will not end up paying a premium, but rather what is fair value in today’s market. URA announced the results of the tender on 5 November 2015. A total of 11 developers put in bids for this 99-year leasehold site. The high number of bidders shows there is healthy demand from developers, said Mr Nicholas Mak, executive director of Research & Consultancy at SLP International Property Consultants. “One possible reason for the relatively high number of bids is the attractive location of this site in the North-East region. It is close to Serangoon MRT Station, which is an interchange station, and NEX, a regional shopping mall,” he said. “Furthermore, developers may want to replenish their land banks given the subdued markets, and the absolute price quantum of this site might be within the range of quite a few large-sized developers & consortiums,” he added. 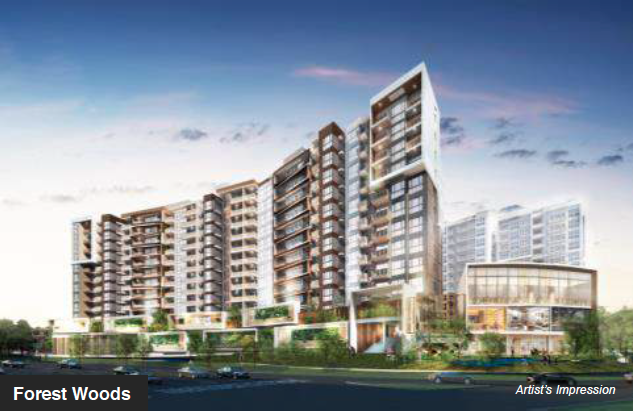 Verwood Holdings (CDL subsidiary), and Intrepid Investments & TID Residential (subsidiaries of Hong Leong)’s winning bid for the Forestwood launch site can likely be traced to its confidence in the District 19 property market. Mr Ku Swee Yong, chief executive of property firm Century 21, said that CDL & UOL know the location and its market dynamics well. Both have recently successfully launched, and are close to selling out projects in the Bartley area just one MRT station away, and have a finger on the pulse of demand here. Assuming construction and overhead costs of about $400 PSF, Mr Mak estimated the break-even cost for the Forestwood Residences launch to be roughly $1,110 to $1,150 PSF. This could possibly work out to a selling price of anywhere from $1,350 to $1,450 PSF, depending on the unit size and facing. Note: As in all condo pricing, the average price usually pertains to the mid-size units, like 3 and 4 bedders. Smaller units are typically priced above the average PSF for a project. For example, one bedders would be priced at least 12% to 20% above that. “In the event we are awarded the site, CDL will explore a condominium development of between 12 & 13 storeys with over 500 units. Apartments on higher floors will enjoy good views across the landed housing enclave,” CDL said after the provisional tender results. UOL launched Botanique @ Bartley MRT about 2 years ago and have almost sold out the project at around $1,300 PSF. However it is in a less desirable location, as unlike the above projects it is not within walking distance of a fair size shopping centre. Please register here to receive updates on the Forestwood launch pricing once available. This entry was posted in Forestwood Residences and tagged forestwood condo on June 7, 2016 by Reviewer. Here is an analysis of the Forestwood condo site location, orientation and surroundings, to help you in your selection of a unit. The site itself is a nice size, about 150,000 sq ft. Tilted in a roughly north-east / south-west direction; or north-west / south-east orientation, depending on which angle you look at it. Bounded by Lorong Lew Lian (where the main entrance will be) on its south-west, Upper Serangoon Road on its north-west flank, Upper Paya Lebar Road on its north-east, and rounded off by Jalan Chermat, a small lane on its south-east. 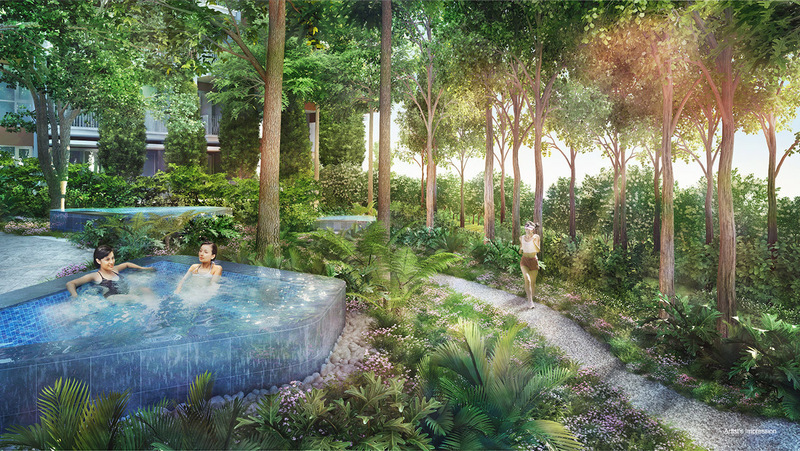 The main entrance to the Forestwood condo will be from Lorong Lew Lian. This is a minor road, across which is a small HDB estate. Pros & cons to this: not a fantastic view to look at, but the HDB flats do help to block out some of the late afternoon sun. Not much road noise from this side. Upper Serangoon Road bounds this side, and it is a rather busy road. On top of that is a viaduct (see photo above) which carries through traffic and helps to alleviate jams at the traffic junction below. Expect traffic noise from this side. Also the west sun. The main advantage is that, looking this way, views from higher floors will be unblocked for quite a distance. Not only is Upper Serangoon Road a very wide road, but across it, is a church and the landed housing estate of Joon Hiang Road & Recreation Road. Flanked by Upper Paya Lebar Road, which is another rather busy road. Expect traffic noise on this side too. But if you can live with that, the advantage is that this side does not get the west afternoon sun, and it is relatively open, as the road is pretty wide here too. This side of the Forestwood condo faces the 2 to 3 storey landed houses along Jalan Chermat. No major road or afternoon sun here. It is also pretty much unblocked, at least as far as the 2 rows of houses along Jalan Chermat is concerned. But note that beyond these 2 rows of houses, is the 10 storey high Cherry Hill condominium. So if you really must have a further view, then get units above the 10th floor. Please register here to receive updates on the Forestwood condominium launch. This entry was posted in Forestwood Residences on June 6, 2016 by Reviewer.